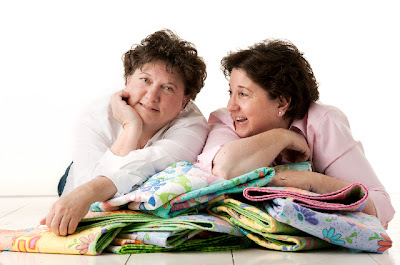 The Fat Quarter Shop is excited to welcome Barb and Mary of Me & My Sister Designs to the Jolly Jabber. 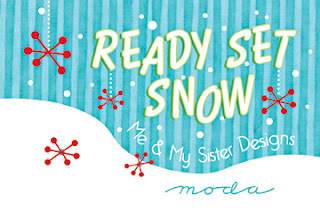 Me & My Sister Designs’ latest fabric collection is Ready Set Snow from Moda. Now are you ready for a ride, because these girls just might cause a giggle or two. On the left is Barb & on the right is Mary. Q: What was the first seed that grew into the Ready Set Snow collection? A: We wanted this group to be a Christmas “basics” group. Something with a touch of the season, but could also be used in lots of different Christmas projects and fabric collections. 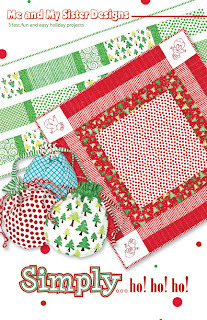 Many of the prints, like the red and green dots are timeless and can be used all year long. The name was decided on by accident. We were having a hard time coming up with a name and we decided to free associate … I said ready.. set.. go! Mary yelled Ready Set Snow! A: Please can we have two … since there are two of us? I love the swirls and Mary loves the dots. Red swirl tone on tone is my favorite and Mary’s is the red dot on white. A: I would like to make a giant log cabin quilt for my bed that hangs all the way to the floor. Mary wants world peace. No music … Law and Order … all the versions, but the original is the best! I love Lenny and McCoy! I like to read. I always have a book going. Guess what I like to read? Well if I like Law and Order … that would be a good murder mystery! Mary loves to read also and is into the Charlaine Harris books right now. Until the new Janet Evanovich book comes out next month. We were both born in Pennsylvania and spent most of our school years in New Mexico. So we both have a good appreciation for HOT Mexican food! We both call Phoenix home and our families live about 3 miles apart. OMG! Wrong question to ask me! I LOVE dogs and have two. A Jack Russell Terrier named Bella and a Miniature Schnauzer named Frasier. Mary has two grand cats, Earl and Beer Belly. He is not chubby anywhere but his belly and the hair on his belly swishes back and forth across the floor when he walks like a broom. He has been on a diet, but never looses the beer belly. 6. Your biggest pet peeve? Going to the grocery store. The grocery store gets me grouchy every time I go. 9. What is your favorite fabric print ever (excluding your own)? Mary loves all 30’s prints! She has a great collection. I have a great old red flannel plaid that I have been saving for years and don’t want to cut into it ever. Oh, wait one more second! 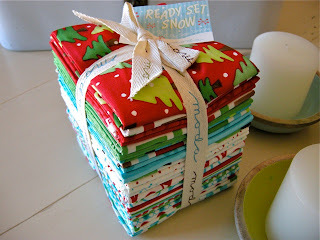 Barb & Mary are hosting a Fat Quarter Bundle giveaway on their blog!! Look's yummy doesn't it!